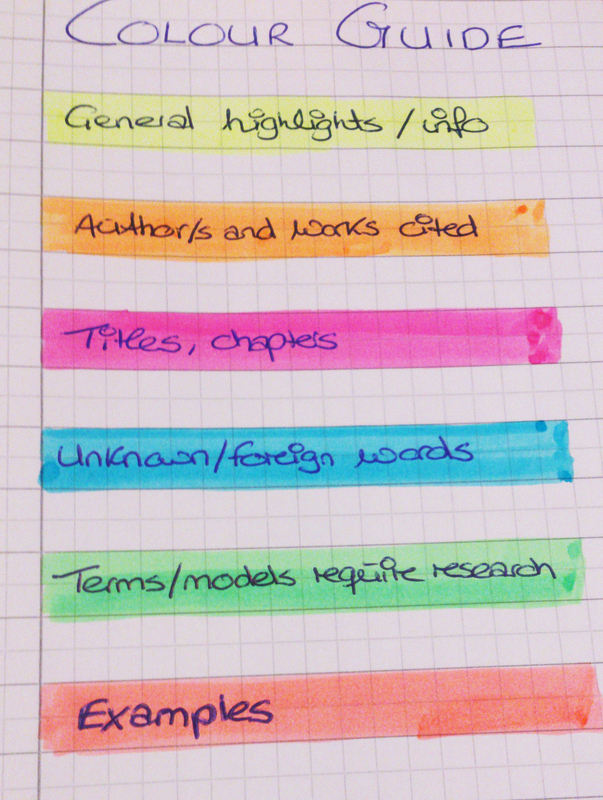 Study Tip: Colour-code your notes | Study. Read. Write. When highlighting passages in your textbooks, print-outs and study notes, it does help to have a consistent colour system. You obviously have to make it relevant to your field of study. For example, lawyers are apparently taught to colour-code using red highlighters for the holdings of a case, green for general law, yellow for facts etc. A medical student might colour-code Latin terms, diagnoses, procedures etc. The trick is not to go overboard with the colours. Only highlight what is necessary, because a completely colourful text will end up confusing you. You can also use one of those ink pens that have a whole bunch of colors in one. Use it when you are taking notes by hand or even reminders to yourself. Coordinate with the highlighter colors for your printed materials. I agree! Though they’re not very common in Germany and hard to get. I used them all the time in NZ and the UK, though. Not sure where my stash of them got to. They probably got misplaced while I was moving back to Germany. I also use index tabs etc. in the colours above and mark on them what I need to do (i.e. an orange one with the name of someone I need to look into or a green one with a model I need to research). That way I can see them immediately when I look at my binder. I actually did this for my grad school notes. 🙂 It worked in helping me find stuff in my notes when I referenced them to write my historiographical papers. Great tip! I’m doing it now for my M.A. and it really helps. One glance and I know whether I need to research something else and who has been quoted etc. I’m doing this for my MBA. Totally helps with revision, when you have to try and review various models and theories! Good tip.